Amber is found all along the coasts of the Baltic Sea, but it is in Poland and Gdansk that you will find one of the few museums that are entirely dedicated to what is called "Baltic Gold". The Amber Museum in Gdansk is four storeys high and has many interesting sections. Among other things, you can see animals and plants that are encased in amber. This is really cool because it is possible to see the petrified animals and plants from all angles and it’s actually almost like looking at them with a magnifying glass. There is also the opportunity to see what different artists have created with amber, ranging between everything from spoons to guitars. There is also a large exhibition of amber jewellery. The building itself has its own history (like The Torture Chamber) and there are separate exhibitions at the museum. The Oliwa Cathedral in Gdansk is a famous and popular cathedral. It has a history that stretches back to the 1200s and over the years has been a natural gathering place for city residents. As with many other churches around Europe, The Oliwa Cathedral has been burnt down and rebuilt several times. The present church was built after the previous one burned down during an uprising in 1577. The building forms the Latin cross and is very long and narrow—over a hundred metres long and only about eight metres wide. Its length makes the Church Poland's longest. Inside the church there are two beautiful altars, a Baroque from 1688 and a Renaissance style from 1606. Perhaps the main attraction is the cathedral's organ. The organ took a full thirty years to build and is famous for its beautiful tones. The organ is used almost every day and if you are lucky you might manage to visit the cathedral during a gig. The European Solidarity Centre is a very interesting place to visit for those who want to experience contemporary history in an intense way. The museum reflects not only Polish history (as the name suggests) but the history of the entire European population. Here you can see films and computer programs that show Polish developments and the steps Poland has taken in order to achieve tremendous changes in society, but in particular you’ll see interesting facts about the Solidarity Trade Union and the strikes and rebellion at the Lenin Shipyard in Gdansk. Among other things, you can see the shipyard gates and a monument erected to the workers who were killed. If you visit the museum, do not miss the chance to take on an audio guide (included in the admission price) to get as much interesting information as possible from the various exhibitions. The museum is located a short distance outside the city centre and the easiest way to get there is by taxi. Murale Gdansk Zaspa is one of Gdansk's suburbs that has been turned into a tourist attraction. Originally, Murale Gdansk Zaspa was like anywhere else in the suburb with boring high-rises located in a very dull environment. What then happened was that they allowed for large murals to be painted on the houses and suddenly this suburb became much nicer and more appealing to visitors. The paintings are huge and take up important subjects from the history of Poland. There are several painted buildings and you need an hour or two to get to see everything. Coming here is not just a cool experience for the eyes but also provides an excellent opportunity to see how the population of Gdansk lives outside the more central parts of the city. To get here you have to take the train to Zaspa and then walk a little way to these high-rise buildings. The Old Town is Gdansk's most magical quarter and here you can wander round among the fine old houses, beautiful old churches, small shops, restaurants, patisseries and much more. 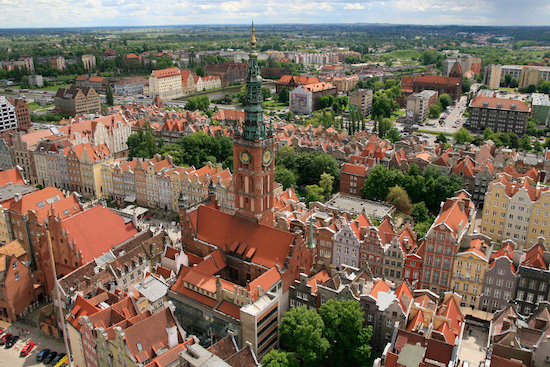 Just as in many other parts of Poland the Old Town of Gdansk was destroyed during World War II. What you see today is a mixture of really old buildings that survived the war and reconstructed buildings that had either been totally or partially destroyed. The atmosphere in the Old Town is very nice and even though it is not that big, you can easily spend several hours here. Settling down in a cosy restaurant or outdoor dining is highly recommended. For those who want to buy amber, many shops selling "Baltic gold” can be found here. Be sure to come here in a comfortable pair of shoes as the streets of the Old Town are cobbled. For those who have children or are just generally interested in animals, Oliwa Zoo can become one of their highlights of Gdansk. Oliwa Zoo officially opened in 1945 and for several years it was not a very remarkable zoo. Recently, however, improvements in animal habitats have been heavily invested in and today Oliwa Zoo has become one of Poland's largest zoos. Here you’ll find zebras, tigers, giraffes, elephants, monkeys, lions and many other animals. In total there are over a thousand animals in Oliwa Zoo. For those who come here with children, there are special sections and activities such as the petting zoo, pony rides and play areas. St. Mary's Church is an attraction that should not be missed during a stay in Gdansk. St. Mary's Church is the world's largest brick church and has space for up to 25,000 visitors. Here you can see the amazing building and all the fine paintings and sculptures, as well as the astronomical clock found inside the church. Depending on what season it is when you visit the church, there are some different things to see and do there. At Christmas for example, you can see a very beautiful nativity scene in natural size, and if you visit the church during the summer months it is possible to go up in the church tower from where you get a great view of Gdansk. As it is a stone church, it can be quite cold in winter and you should dress properly before a visit. Artus Court (or King Arthur's Court in English) is a large building in the Gothic style, located at the city hall in Gdansk. Artus Court was built in the 1300s and was formerly a court and meeting place for merchants and city residents. The name Artus Court comes from the medieval legend of King Arthur. The building was destroyed in one of the Red Army offensives during World War II, but was rebuilt after the war. Visitors can enter the building, where you can visit Dwor Artusa’s own museum. There are several beautiful paintings and statues to look at and a section upstairs where you can learn more about the history of Poland. It does not take very long to visit the museum—an hour is usually enough.